The Permanent Service for Mean Sea Level (PSMSL) hosted a workshop on major research topics in sea level science in order to commemorate its 80th anniversary. 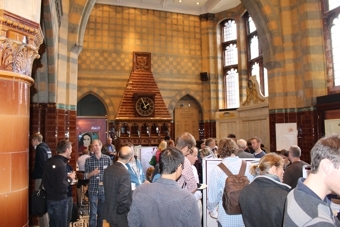 The workshop was held at the University of Liverpool's Victoria Gallery & Museum on October 28 and 29, with over 130 registering to attend (group photos: 9.0 MB, 9.3 MB). One of the highlights of the meeting was three hour-long talks reviewing aspects of the Intergovernmental Panel on Climate Change's Fifth Assessment Report (Working Group I). These presentations, along with 13 others covering many aspects of regional variability in sea level, are available from the programme page. In addition, over 40 posters were presented at the workshop. Prior the workshop, over 20 (group photo, 4.3 MB) braved the winds and attended a field trip organised by Prof. Andy Plater to the saltmarshes of the Dee estuary. The group discussed the ability of saltmarshes to record long-term sea-level change. In addition, the field site also provided an excellent setting for discussing the range of socio-economic impacts consequent upon rising sea levels. This workshop preceded the Global Sea Level Observing System (GLOSS) Group of Experts (GE) meeting held on Wednesday, 30 Oct, to Friday, 1 Nov. The presentations and documents associated with this meeting can be found on the Intergovernmental Oceanographic Commission (IOC) website: Thirteenth Session of the GLOSS GE.